The IMPACT (Intein Mediated Purification with an Affinity Chitin-binding Tag) system is a novel protein purification strategy that utilizes the inducible self-cleavage activity of protein splicing elements (termed inteins) to separate the target protein from the affinity tag (1). It distinguishes itself from all other purification systems by its ability to purify, in a single chromatographic step, a native recombinant protein without the use of a protease. Each intein tag contains a chitin binding domain (CBD) for the affinity purification of the fusion protein on chitin resin (2–4). Induction of on-column cleavage, using thiol reagents such as dithiothreitol (DTT), releases the target protein from the intein tag (Figures 1,2). The vectors included in this kit allow for the fusion of the target protein at its C-terminus (pTXB1) (3,5) or at its N-terminus (pTYB21) (4,6) to the intein tag. 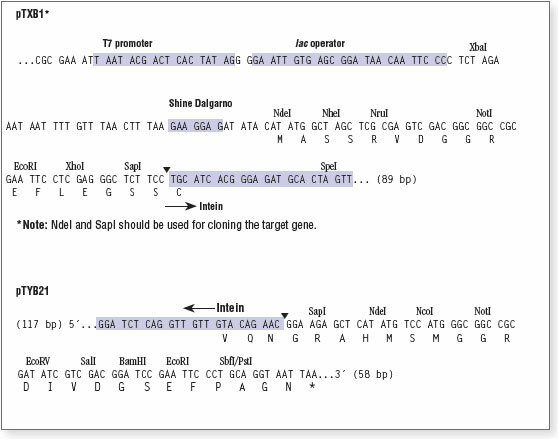 In addition, with the use of pTXB1, native recombinant proteins that possess a reactive C-terminal thioester can be isolated for applications, including protein semisynthesis and site-specific labeling [3,7, Intein Mediated Protein Ligation (IPL, Appendix I)]. Lane 1: uninduced cell extract. 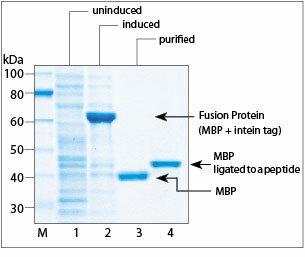 Lane 2: induced cell extract showing expressed fusion protein. Lane 3: MBP fractions eluted after inducing cleavage overnight at 4°C. Lane 4: MBP ligated to a peptide containing an N-terminal cysteine. Marker M is the Protein Ladder (NEB #P7703). ▼ indicates intein cleavage site. 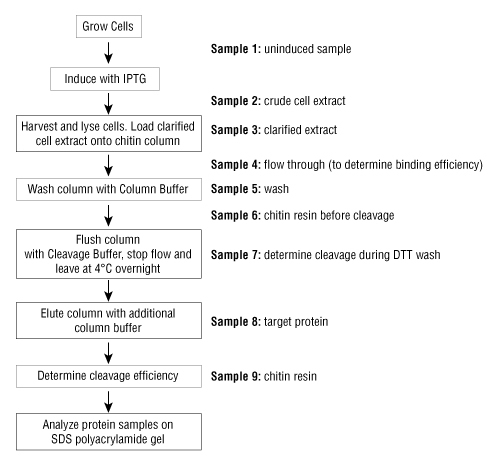 Sample collection for analysis by SDS-PAGE is indicated. Chong, S. et al. (1997). Gene. 192, 277-281. Chong, S. et al. (1998). Nucl. Acids Res.. 26, 5109-5115. Evans, T.C. et al. (1998). Protein Sci.. 7, 2256-2264. Watanabe, T. et al. (1994). J. Bacteriol.. 176, 4465-4472. Muir, T.W. et al. (1998). Proc. Natl. Acad. Sci. USA. 95, 6705-6710. What are the advantages of the IMPACT System? If my target protein is sensitive to DTT , which vector(s) should I use? What is Intein-mediated Protein Ligation (IPL)? What has IPL been used for? Where can find all IMPACT FAQs?